All we were curious to knew what will be the 4th Prince Wang So reaction over Hae Soo's apology. Though he new Hae Soo didn't do it intentionally but the anger for nothing didn't let Prince Wang So to be calm. He just scold Hae Soo first to have a look on his face and the next moment he told he hates the way he look at him. Actually Prince Wang So was all confused of himself what he wanted wasn't sure. All we were relaxed and happy he didn't strangle Hae Soo's neck. 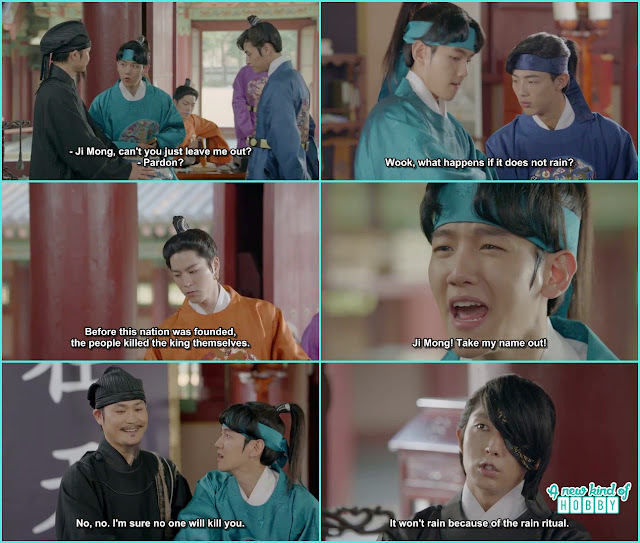 Baek Ah the 13th Prince too understanding and caring. He came ro make things smooth between 4th Prince and 10th Prince. But was relaxed to see that he already forgive and it wasn't a big deal for him. Somehow he had to take off his mask and face off every one. But he was confused about Hae Soo and become all upset for his behavior. It was a relieve that things came back to its normal position and 4th Prince Wang So wasn't angry at all. We wonder its not the modern century men do all the makeup but in ancient time the king also do the makeup. 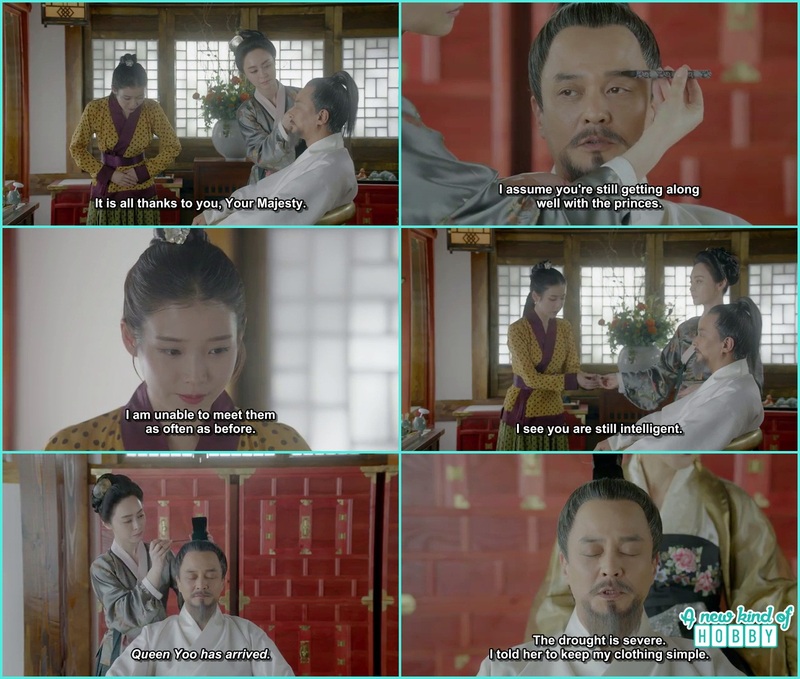 It was King Taejo who got his makeup and hair done by Royal Concubine and Hae Soo. 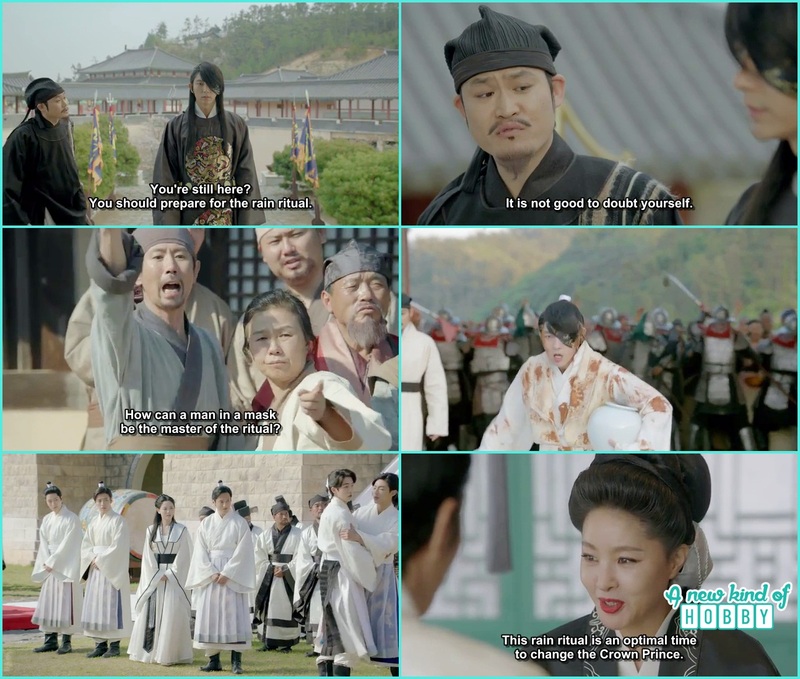 Hae Soo was feeling a bit guilty that things got misunderstood at 10th Prince Birthday and some how she as involved. So she prepared every one favourite tea. But when she was about to serve the 4th Prince he got all annoyed take it away. You are having tea while there is drought in the country. She was all upset even though she try to make his favourite tea why is he all getting angry so was every one seeing the 4th Prince anger. It was Baek Ah who helped Hae Soo find every ones favourite choice tea but wonder why didn't it help as 4th Prince already forgive the 10th Prince and get along with all of them normally but now he is angry with Hae Soo and avoiding her for no reason. The 10th Prince went with Sun Duk to play in the field as there wasn't anything of fun for him in the palace. They both set a trap to catch a bird. After waiting a long time when they catch the bird they were happy Sun Duk just strangle the birds neck and want to cook it. The 10th Prince became all angry "You Murderer You that cute little thing, how could you do that" we smiled over his cuteness. He left from there saying i won't play with you and Sun Duk was all confused will he going to eat it alive. Hae Soo went to meet the 8th Prince at Washing Hole. She was happy to see him, they talked for long. Hae Soo shared that some times she feels lonely and miss the outside she wanted to go to the market and visit Myung Hee grave. 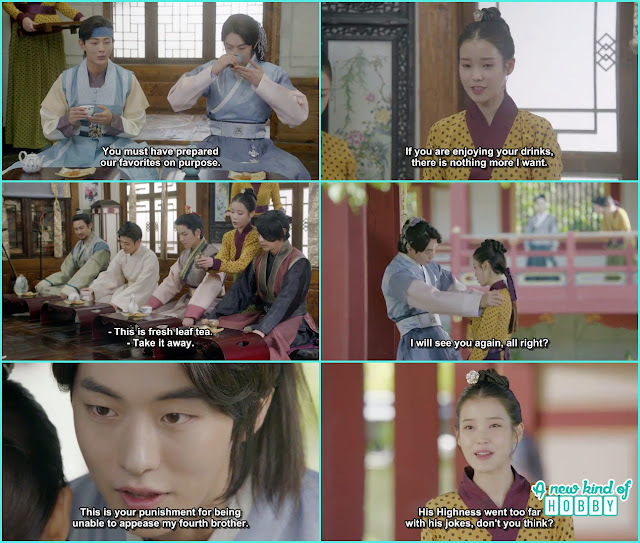 The 8th Prince Wang Wook told her to wait for a little and he will ask the King if it rains after the ritual Prayers let go Hae Soo from the palace. As King will grant everyone a wish may be a wedding or a maid to leave the palace and live her life freely. So the 8th Prince gave Hae Soo a hope to hang in there a little bit and he will take her out from there. The Crown Prince was about to leave the palace to fight off the rebellions. Hae Soo came to say goodbye and also bought the medicines for him, all she cared for Crown Prince health and told him if something happen like before he should not scratch and not use hot water. On her way back Queen Yoo maids forcefully drag Hae Soo to the Queen. She scold Hae Soo for going out of the limits and also wanted to knew what kind of disease Crown Prince suffering from. She was the person who never even like anyone beside herself. 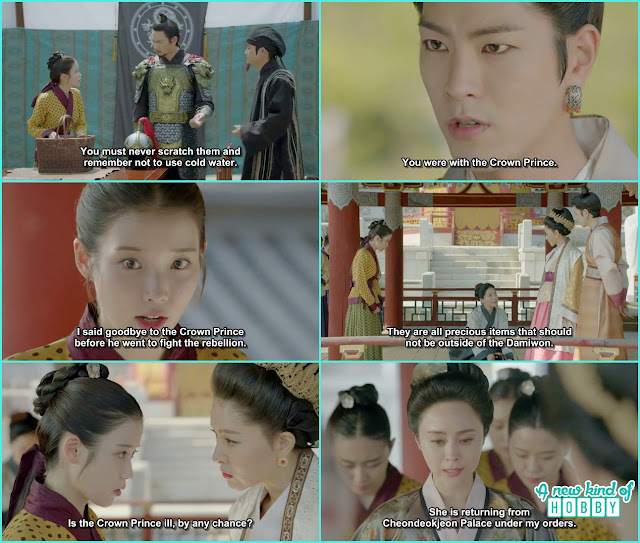 But thanks to the royal Concubine who came and rescue poor Hae Soo from the situation saying it was her orders her to go to King and Damiwon has rules not to reveal anything regarding the king. If there is anything to be punish her she will be the one to take care things and her people under kings order. It was a relieve that Hae Soo's escaped the witchy Queen Yoo's punishment but we didn't expect that she would receive a slap from the Royal Concubine as of breaking the rules and doing things she shouldn't be. She was also warned to stay away from the Prince as the palace is the most dangerous place. For Hae Soo it was shockingly surprised she without any fear ask the reason why always she got punished for no reason and have to bear the scolding and beating all the time. She never done anything wrong all she wanted to help others. The royal Concubine faint Hae Soo helped her back to the quarters and look after her. 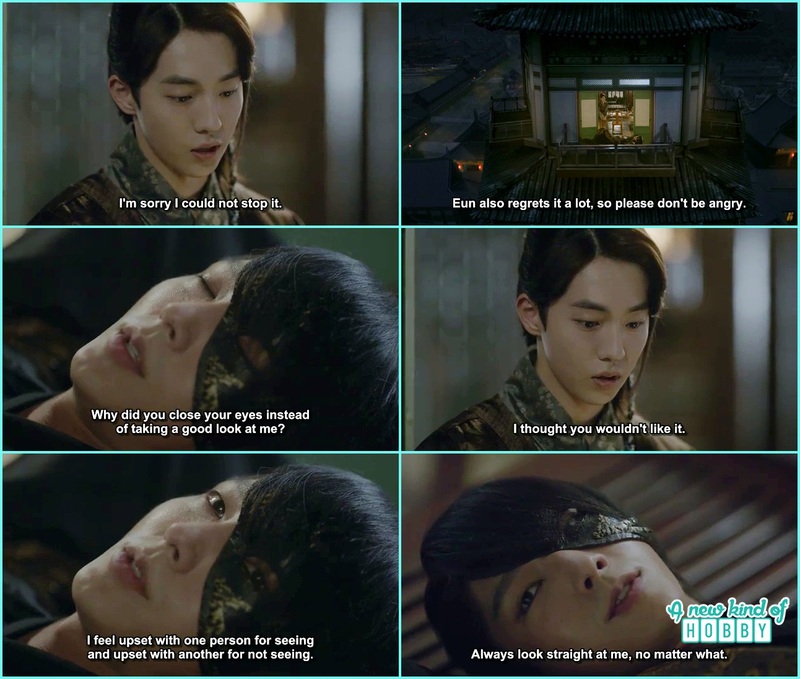 Though she was being too harsh but Hae Soo has a soft heart now when she knew the reason why she was treated like this she was all satisfied that actually she was being cared and trained as the Roiyal Concubine sees herself in Hae Soo. It was to choose who will be doing the ritual prayers as there was no sign to rain and people were suffering from drought. Ji Mong the astronomer was collecting all the prince name tags and it was really a lovely scene which shows how the Prince love their lives specially the 10th Prince who nearly started to cry what if he was chosen he don't want to go it that way so take his name out of it. It happen to be the 4th Prince Wang So to continue the ritual prayers as of the crown Prince wasn't around. The people seeing him wearing the mask didn't accept him to offer and called him monster. Moreover they started throwing stones at the 4th Prince. It was an unbelievable situation nearly hard to bear for the 4th Prince. We were suspicious of Queen Yoo it might be her doing and it happen so. It was all planned by Queen Yoo to make humiliate the 4th Prince of his face scar and make him embarrass so he could not gather the courage to go with the ritual prayer for the rain and she was successful in 90% of doing that. We feel pity for the 4th Prince how come her own mother make things go as hard as a rock to thrown at her own son. Hae Soo also feels sad so was every body she searched the 4th prince and wanted to comfort her. After a long search she happen to find him lying in a boat. At first she though is he dead and wanted to check on him she stepped in the boat but couldn't manage to keep her balance and was about to fall in the water suddenly the 4th prince open his eyes and grab her hand. he didn't let her fall in the water but instead made her fall on him. It happened out to be a most romantic scene for the two of them. Hae Soo got controlled of herself and sit back to normal she didn't let go of guards her emotions. She told the 4th Prince everyone is looking for him don't be too upset things aren't these hard only for him every one want to live and survive and many have the worst life he even never imagine of it. The 4th Prince was too impressed by Hae Soo but didn't show and threw a question that did Hae Soo know the reason why she was born. She said i am thinking about these day but i couldn't get any answer yet. The 4th prince question make Hae Soo to think more hardly why she was born and why she is here in Goreyo and now stuck in the palace. She though if she able to help him she might get a chance to leave the palace if it rained. 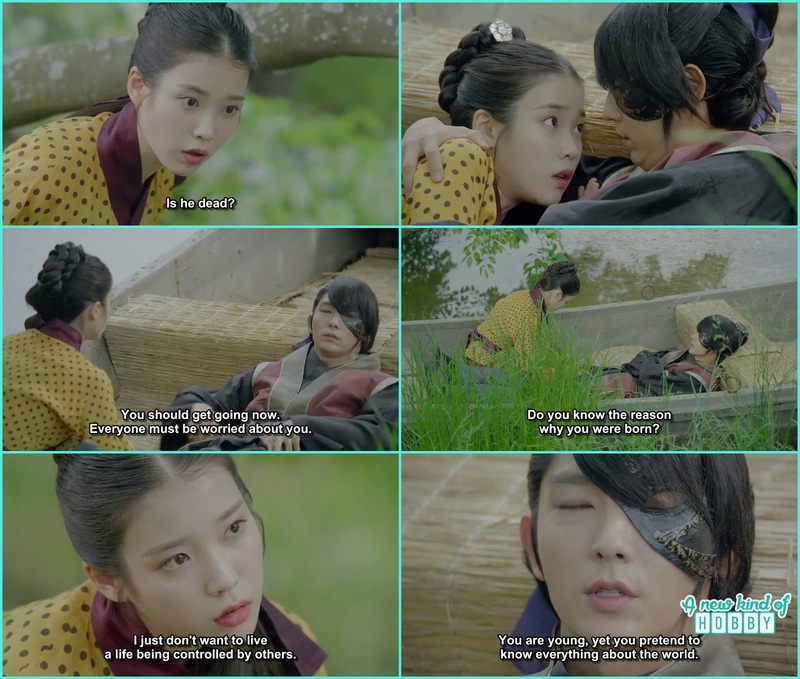 She went to 4th Prince and told him that she can help him take the mask off and face the people. As she remember how she use foundation in modern times she just use that procedure and help the 4th prince by hiding the scar using the makeup and foundation base. She was the first one who ever touch the 4th prince face. All went so cool we wonder how the scar from his face disappeared as we already saw the promo so it was by the help of Hae Soo. The 4th Prince become all confident to continue with the prayers. But the 3rd prince stopped him saying you can't go with the face of your wearing the mask and hit the mask but was shocked to see the scar was gone. Ji Mong was all happy and they started the ritual prayers The people again point that's its the monster again how can he bring rain to us. Just hit him but some body notice his face and shout the scar is gone its a miracle and everything changed, the people who can't bother to see the 4th prince leading the ritual prayers were now begging him to bring rain as the one miracle already happen by vanishing his face scars. The 4th Prince successfully came back to the palace and now its the turn to surprise to Queen Yoo she wasn't only surprised but shockingly worried where Wang Yo went why is it the 4th Prince leading the prayers and seeing his face she almost got a heart attack where the scar went. Other people was also surprised to see the 4th Prince without mask and even that the scary scar wasn't there. Finally the heaven helped and it rained in Goreyo. 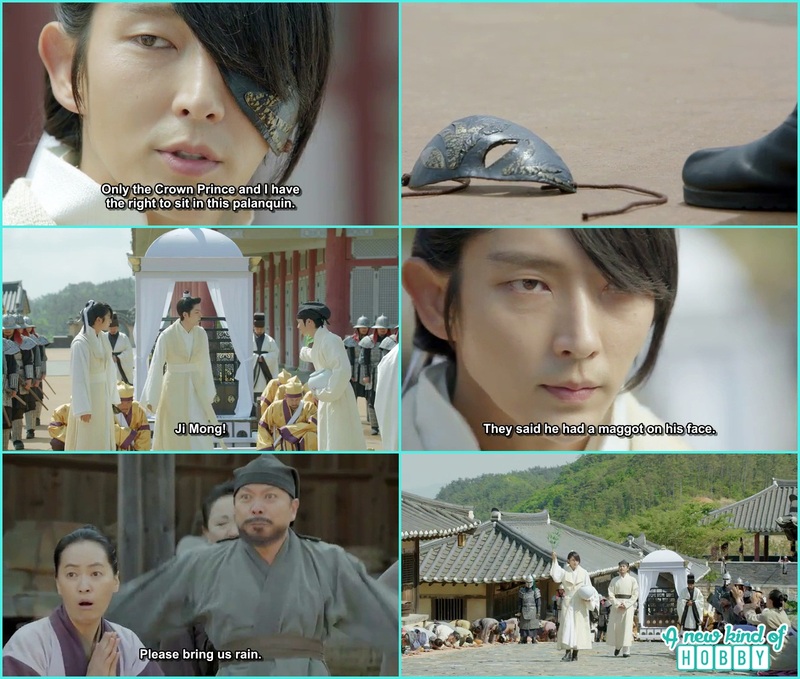 But Hae Soo got a vision again of King Gwangjong it was the 4th Prince Wang So who will be the future king of Goreyo King Gwangjong. Seeing this she was all shocked the episode ends here. We really enjoyed watching this episode as of the others and there was a lot to write but due to lack of time we will just end it here. 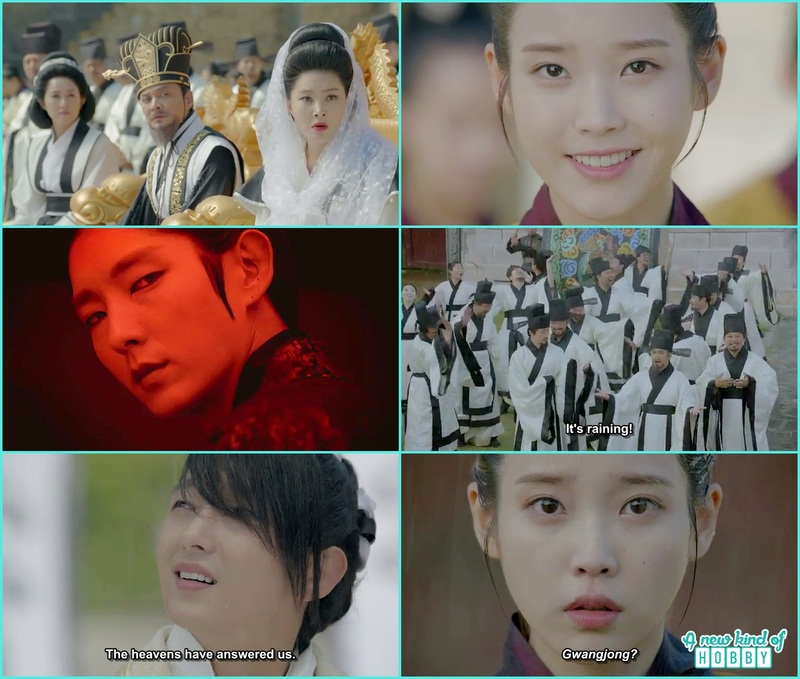 Let's meet in episode 9 review to knew ore about the 4th Prince Wang So and Damiwon maid Hae Soo.